Hello everyone! So I was playing Spyro Heros Tail and i havent played it in a while so I am only on the second level (sorry name dosnt come to mind right now). I just finished the part where i destroy the second dark crystal, and noticed the whirlwind that goes up leads back to where i started. I start getting confused now because I don't think there is anywhere else to go and I don't know where to go now. Also, i tried the Hunter minigame and got the light crystal at the end. Is there anything else i need to get from there? Please help me I amreally stuck and can't find any good walkthroughs because none of them make sense to me. Im worried that im stuck because i thought i had done something wrong HELP MEEEEEE !!! 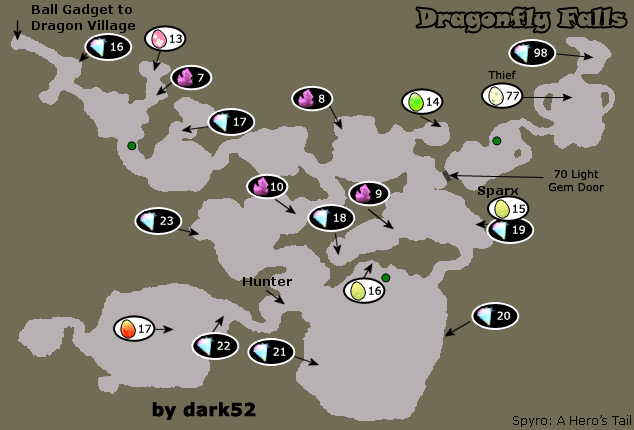 How many Dark Gems do you have in Dragonfly Falls? There are 4 Dark Gems there, and if you got all, you can leave the level. Otherwise, here you have video walkthrough, first part. Nothing else will make it clear better, this is a bit hard to describe in words where to go. When you get all of the Dark Gems you must track back to the Ball Machine.